I came across this darling picture of my daughter headed to summer camp. What great memories! Do you have kids going to camp this summer? Here’s what I did for packing for my kids for camp. Camp is all about fun for the kids not staying clean or worried about their belongings. I used Ziploc® bags for their clothes. I would put an entire outfit in one bag – socks, undies, a top and a bottom. I packed a Ziploc® bag for every day that they were to be gone and put it in their suitcase/or duffel bag. When it was time to get dressed each morning, they would open a new bag and put on whatever it contained. I also used a bag for their swim suit, towel and sunscreen. I told my kids that it was okay for the dirty clothes to go back in their suitcase without a bag. That way they knew what was clean and what was dirty. With my son Branden, it was not unusual with him to come home with half of his clothes still bagged! He was so busy having adventures that he would forget about changing clothes! Oh well, at least the clothes were available! I’m lovin’ Pinterest! When a client needs a special twist on organizing, I head over to Pinterest for ideas. In fact, follow me on Pinterest – I’m always pinning! Here’s a photo collage of some great kids closet to round out my closet series this month. In trying to give credit where credit is due, click on the links below the photo to get more information. Love the colors and the simplicity of this closet. The boxes can hold shoes, pjs, toys, you name it! Wrapping up this month’s segment on organizing your closets, I couldn’t resist one last tool recommendation. 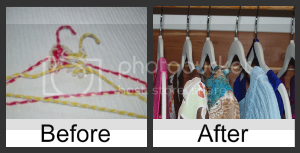 -Before I put everything back I re-hung all the clothes on the new, slimmer hangers my mom gave us for Christmas. What a difference! They take up so little space on the rod. I highly recommend them. In my last post, The Basics of Closet Organization, I listed the 3 steps to getting your closet organized. I don’t just write this stuff, I actually do it! In February, I challenged myself to minimize the amount of clothing I keep. I had read a great article on the Small Notebook blog that motivated me to go into minimalist mode in my clothes closet. Let me first say that I come from a long line of clothes hoarders. My grandma has 3 closets full of clothes; my mother and my sister are running neck and neck for 2nd place! (Yes, Mom and Sis, if you are reading this- you have tons of clothes!) At any rate, I started out to see how much I could pare down my wardrobe.